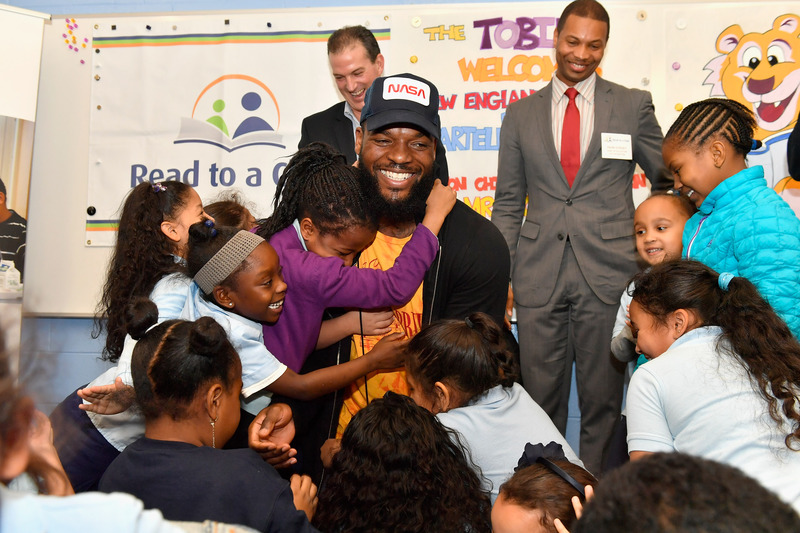 Boston, MA, November 15, 2016 – National non-profit literacy and mentoring organization Read to a Child®, The Imagination Agency and Boston Public Schools announced that Martellus Bennett read his children’s book “Hey A.J. It’s Saturday!” to children today in Read to a Child’s Lunchtime Reading Program at the Maurice J. Tobin K-8 School. New England Patriots star tight end, children’s book author and founder of The Imagination Agency, Martellus was joined by Boston Chief of Education Rahn Dorsey, Read to a Child CEO Paul Lamoureux and Boston Public Schools leaders to highlight the importance of mentoring partnerships that boost literacy skills and self-confidence in urban public school students. The Maurice J. Tobin School is one of 17 public elementary schools in greater Boston where Read to a Child operates its Lunchtime Reading Program. Read to a Child enlists and manages a force of 1,500 corporate volunteers from more than 100 organizations that visit urban elementary schools once a week and read aloud one-on-one to children during lunch. This time spent with a caring adult ignites a love of reading in struggling children, while providing students with the skills and self-confidence to succeed in school and in life. To get a chance to meet Martellus and hear his inspirational story directly, tickets (which must be purchased in advance) can be found here. Read to a Child (www.readtoachild.org) is a national nonprofit literacy and mentoring organization that inspires caring adults to read aloud to at-risk children to create better opportunities for their future. Research proves that reading aloud to children is the single most important activity for building the knowledge required for eventual success in reading and, thus, likelihood for success in school and life. 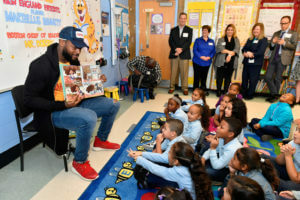 Read to a Child currently partners with more than 100 corporations and institutions nationwide that provide 1,500 volunteers who read aloud to 1,200 at-risk elementary school students in greater Boston, Detroit, Los Angeles and Miami, as well as urban centers in Connecticut. Martellus grew up in Houston, Texas where from a young age he was a standout two-sport athlete destined for a future in athletics. He was a top draft prospect for both football and basketball and went on to play both sports at the NCAA Division 1 level for Texas A&M. Deciding to focus on football, Martellus was drafted in the second round of the 2008 NFL draft by the Dallas Cowboys. He now plays tight end for the New England Patriots. In addition, as an author, artist and entrepreneur, Martellus Bennett is known not only for his presence as a playmaker on the football field, but also for his larger than life personality. With an impressive list of exceptional talents, both on and off the field, and enough charisma to charm his critics, Bennett has won the hearts of fans across the country. This bright young star has paved the way to a long, lasting and powerful career as a player, entertainer and businessman. As a voracious reader, Martellus read every children’s book to his daughter. But he became acutely aware that none of the main characters looked like her, so he decided to write his own. Inspired by Bennett’s daughter, Jett, “Hey A.J. It’s Saturday!” is a children’s book in which A.J., the book’s protagonist, takes readers on a wild journey throughout her day as her imagination comes to life. She discovers that there is a wild and strange world just downstairs in her kitchen where a breakfast feast is being served by creatures and beasts. “Hey A.J. It’s Saturday!” is the first in the “Hey A.J.” book series and each book purchased is accompanied by a “Hey A.J.” app. Founded by Martellus Bennett, multimedia firm The Imagination Agency is a wondrous group of monsters and lost imaginary friends tasked with creating, drawing, writing and imagining fantastical adventures for kids all over the world. Be it by books, art, apps, games, cartoons, films or toys, The Imagination Agency entertains and delights by bringing stories to life from Martellus’ own imagination, and encourages kids to explore their own creative outlets. With a universe of characters to share with the world, all of whom have been like lifelong personal friends, Martellus and The Imagination Agency are excited to take you on adventures that no one else can. The Boston Public Schools (BPS), the birthplace of public education in the United States, serves nearly 57,000 pre-kindergarten through grade 12 students in 125 schools. BPS is committed to transforming the lives of all children through exemplary teaching in a world-class system of innovative, welcoming schools. We partner with the community, families, and students to develop in every learner the knowledge, skill, and character to excel in college, career, and life.